(Beirut) For years terrorists have traversed the border between Lebanon and Israel in which to cause mischief inside the Jewish state. In 1948 Lebanon invaded Israel when it was formed in which to destroy the fledgling state. After the 6 day war in 1967 and the Yom Kippur war in 1971, the Arabs realizing that they lost every time at full scale symmetrical war against the IDF, hit upon the idea of asymmetrical warfare, (Terrorism) which they carried out on a regular basis against the civilian population of Northern Israel. That was until 1982, when Israel invaded Lebanon with an aim to stop these murderous attacks. 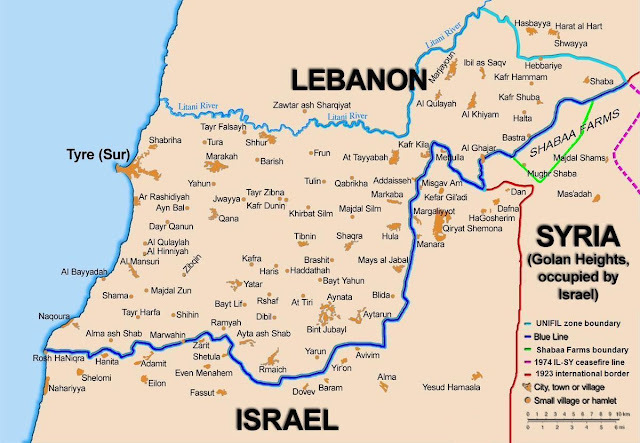 After kicking out the PLO, the Israelis retreated back inside Israel after setting up a buffer zone within Lebanon and there they remained until they left in 2000. As is the way of the Arab when it comes to Israel any concession from a Jew is seen as a weakness and must be taken advantage of. Which is why Hezb-allah has no problem attacking Israel, however after it invaded Israel in 2005 with an aim to bolster its public image , saw Israel invade the country again. the cost to Hezballah was high over 1000 dead in 11 days, contrast that with the Syrian civil war where in 5 years the terrorist group have lost around 2000 thugs. The conflict inside Syria has now turned in favour of the Government and an end maybe in sight. With that in mind Hexballah has started thinking about the future , it can only exist if it has an enemy and who better than the jew to pick a fight with. Which kind of explains the rash of recent Israeli air-strikes inside Syria on Hezb-allah arms shipments in which to prevent the Iranian puppet from receiving advanced weaponry in which to secure its murderous future. Get that, Israel is building a wall inside its own borders in which to stop terrorists from entering the country from Lebanon and the Lebanese claim it is an act of war. That sums up the victim hood mentality of the intolerant Arab and why there will never be peace in the region as long as insist on setting the agenda for peace. Australia: Africa gang problems continue. South Africa: To cut diplomatic ties with Israel. Malaysia 10 suspect ISIS terrorists arrested. Gaza: New female centric TV station launched. India: Terrorists attack Army camp , 10 dead. Syria: Another 2 British ISIS terrorist caught.